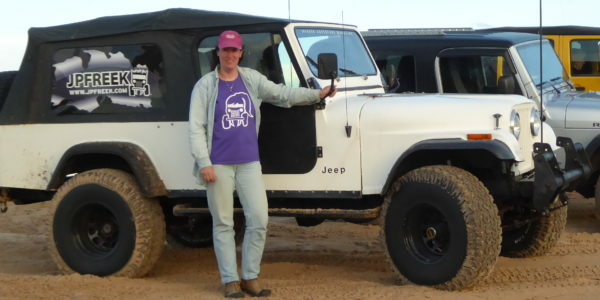 Driver for Team JPFreek, Julie Covert, lets us know some of her thinking as she prepares for the Rebelle Rally: finishes her ’82 Scrambler with her husband Hugh and starts training. Support Team JPFreek and get some cool swag or put you/your company’s name on the Jeep! What will be difficult for you? Not being able to stop and take pictures when ever I want. In my family, usually I’m the navigator along with being the photographer. So being behind the wheel watching the beautiful scenery go by while under time limits will probably be the biggest challenge. Easy? I consider that a dangerous word to use. It seems just when I think something is “easy”, a monkey wrench gets thrown, so I won’t say that anything will be necessarily easy. What won’t be difficult is sleeping out on the trail. I love camping. Which makes me realize that it will probably be easy to meet lots of amazing women who are also doing this event. What will be easy is not feeling like I need a shower every day. The Rebelle Rally provides showers facilities as part of the traveling village but when I’m out camping in the backcountry a shower is one of the farthest things from my mind. Part of the fun of roughing it when on the trails is enjoying the miles of trail clinging to clothes. The dirtier the better – to a certain degree. I’m looking forward to seeing a part of the country that is new to me. I’ve driven north and south of the area we will be traveling through, but I have not traveled in the eastern California region between Lake Tahoe and San Diego. I’m also looking forward to testing my skills and wit, as I’ve never done anything like this before. Tenacity, perseverance, embracing a challenge and keeping a level head when faced with a problem. I anticipate that this will be a test of mental stamina, as much as driving and navigating skills, and being able to react to new situations at any given time, which I am good at doing. Usually in a crisis situation I wind up being the go-to-person, as does my teammate Jennifer. I’m also good at math and that will be a huge part of the navigation process. If there is one thing you might get into an argument with your teammate about, what might it be? I really don’t know. Jennifer is my husband’s cousin’s wife. We have know each other about seven years. However all the time we’ve spent together has been with other family. We have had very little time as just the two of us, so it’s difficult to say what we might get into an argument about. I do know that sometimes I can be blunt, especially when time is of the essence. Hopefully she won’t take it the wrong way. What’s an accomplishment thus far that you are most proud of? There are a few – coaching an undefeated little league soccer team at the age of 15; publishing a calendar in three weeks to raise over $3,000 for the Red Cross to benefit survivors of Hurricane Katrina; self-publishing a photography coffee table book and selling almost 800 copies in three years; and raising over $10,000 through crowdfunding to help pay to go to the Rebelle Rally. Why do you want to do Rebelle Rally? A friend and I were talking last winter about the Gazelles rally in Morocco, which I had read about in JPFreek Adventure Magazine. That segued into talking about the new Rebelle Rally. My competitive nature was piqued and I knew the only way I wasn’t going to do it was if my husband was against it. My friends and family will tell you that I love challenges, of all sorts, like living off-the-grid on a remote island in Michigan’s Upper Peninsula. I drive a Jeep year-round, and seven months a year that involves driving on a two-track with mud and lot of snow. I loved the backcountry Jeep camping trips we have done in Utah’s Canyonlands. So it seemed only natural to take on the Rebelle Rally. What do your family and friends think of this? Some think I’m crazy, but they know that this is exactly the type of event that I love to do – something that is very different and challenging. They enjoy living vicariously through me. Did you ever think you would do something like this? What navigating experience do you have? My mother taught me how to read a map at a very young age and I loved to study the map as we traveled on our family vacations. When I met my husband, who is a tall ship captain, I learned how to navigate on our sailing trips. Both of those skills have come in handy being the navigator for our Jeeping excursions. What driving experience do you have? Although I’ve been driving a Jeep for only six years, I’ve had a lot of time behind the wheel both on and off-road because of where I live. I have lots of experience with a variety of types and depths of snow. I’ll be doing some sand dunes training a couple times this summer at Silver Lake Sand Dunes to get a feel for sand, which I’ve been told is a lot like snow. How did you get into off-roading? Out of necessity. My husband has owned many Jeeps over the years. We live on an island. When I moved in with him six years ago we bought a Jeep for me to drive October through April, as my VW Golf would not handle the two-track that we have to drive during non-boating months. We hike a mile from the house to the end of our island, then cross a couple hundred feet of water where it is shallow enough to wade to the main island of Drummond, and then hike another half mile to the Jeep. From there we drive out three miles of two-track to get to pavement and on to town. What type(s) of Jeeps do you drive? Have you driven? We have five Jeeps. I have an ’05 LJ as my daily driver and my husband has an ’06 LJ Rubicon. We have two Scramblers, one of which is our Jeep for the Rally. And we have a YJ as a “work truck” for the island. I’ve also had the opportunity to drive a couple other Jeeps owned by friends, but that was on pavement – fun but nothing too exciting at the time. What’s the neatest/coolest Jeep you’ve ever driven? By far the “coolest” Jeep that I’ve been in is the Alaskan Postal Scrambler that JPFreek’s editor-in-chief Eric Walton has. What’s the most embarrassing experience you’ve ever had? I apologized to my guests for what was going to happen next – I got into my pseudo-bathing suit – I took off my Keen shoes, peeled off my Gramicci pants, and put my shoes back on. I then started pulling out the winch line. Before I could secure the winch line a guy in his lifted JK with a snorkel drove up behind us. His teenage son was with him and they offered to help. “You wouldn’t know that I live here, would you,” I said and apologized for the way I was dressed. I then explained that when all was done I didn’t care about wet feet, but wanted dry pants to put back on. They helped winch me out of the puddle. Because the Jeep wouldn’t start, due to the drenched old starter, we turned my Jeep around – think 8 point turn with a winch on a two-track – and pulled me back through the puddle that I had just come out of. Back on dry trail he pulled me so I could pop the clutch to start the Jeep back up, which fortunately it did on the second try. I offered to buy him a “thank you” drink at the restaurant that evening during my book signing party, but he never showed up. (Lesson #4 – Jeepers are great folks and most are even willing to help strangers out.) So I still owe Nate a drink. How can someone get involved with Team JPFreek? We’re still doing fundraising as we have equipment and travel costs to cover. People can “join” Team JPFreek by donating to the cause. There, folks can pledge to get cool t-shirts, their name on the Jeep, their logo on the Jeep or even a off-road off-the-grid adventure with me on Drummond Island. And it is great help by spreading the word and asking your friends and family to join you in supporting Team JPFreek as we take part in the first women’s only off-road rally in the US.